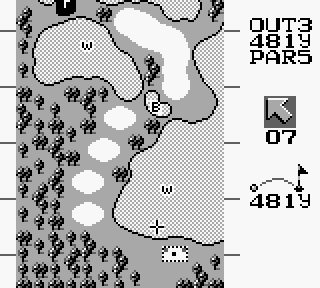 Released about 6 months after the launch of the Game Boy, this was the first golf game to appear on the system. As is to be expected, you play as Mario and have two course options; USA and Japan. The course design, while not particularly realistic, keeps the game interesting by offering up various challenges through the liberal use of sand bunkers and water hazards. The three click swing system, ubiquitous in golf games from the classic era, is present here but is better implemented than in Nintendo’s previous golf title of the same name for the NES. While the non-interactive overhead map prevents you from getting the exact yardage to your intended target, hash marks on either side of the map at 100 yard intervals aid you with club selection. Again, as is common with earlier golf games of this era, the distance range for each club is not displayed and therefore must be learned. The game also uses the matrix of arrows method to display the contours of the green. The overhead map of the hole as well as the green may be called up at any time while setting up your shot, which helps you to aim for an appropriate spot on the green. Making it friendlier to a handheld grab-and-go platform, the game automatically saves your progress after the completion of each hole, allowing you to simply turn off the console whenever needed knowing that you can pick up right where you left off. The cartridge has two game save slots, allowing you to simultaneously have a round going at each course. My only beef with the game is that the ball rolls too much once it hits the ground, especially on the green. I’ve had balls hit the near side of the green, roll all the way across, through the rough, and into a water hazard. This is annoying, but just needs to be corrected for when you’re setting up your shot. Overall, this is a great game that surpasses its big brother on the NES in just about every way. Buy Golf on GameGavel or Amazon. Tagged 1990, Game Boy, Gameboy, Golf, Nintendo, Review, Sports. Bookmark the permalink.